Learn how we solved this problem. Application: Pick up pump with a hoist and mount it to the inverter/upender station. 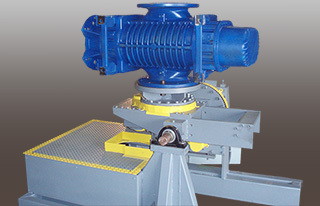 Once mounted, the pump was required to move and rotate in any axis. Problem: Customer had a 1,500 pound pump that took several hours to assembly due to the complex angles the customer was required to rig to. Solution: The customer was supplied with a two motor system complete with Magnetek VG+ drives. The pump inverter drives included encoder feedback to monitor motor torque and speed. This provided precise controlled rotation of the customers pump. 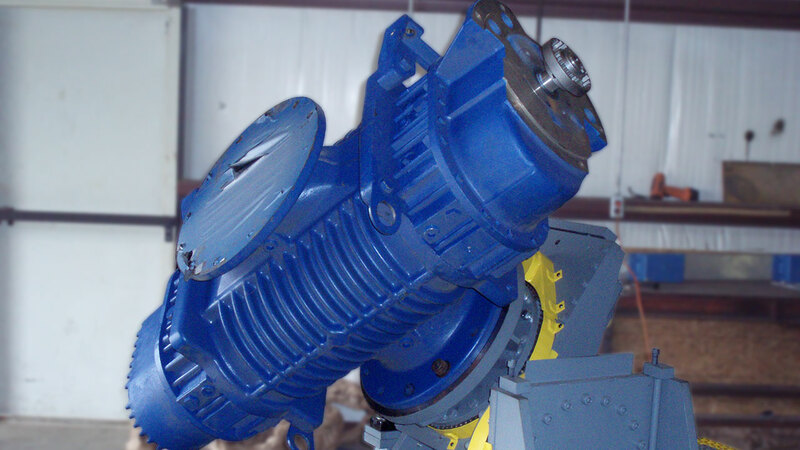 One motor was used to pitch the part 90 degrees from horizontal to vertical, and the other motor allowed for 360 degree continuous rotation around the base bearing. Result: The customer installed the upender and was able to increase assembly time from 8 hours to 2 hours. Contact Ergonomic Partners for a quote on a custom pump inverter for your application. Ergonomic Partners serves clients from coast to coast, Canada, Mexico and especially focused in the states of Missouri, Illinois, Indiana, Kansas, Arkansas, Mississippi, Nebraska, Tennessee, Kentucky, Iowa, and Oklahoma.